Stories set in a dystopian future are always going to be hard hitting, in a way that makes you question your stance on a range of worldly topics and morals. 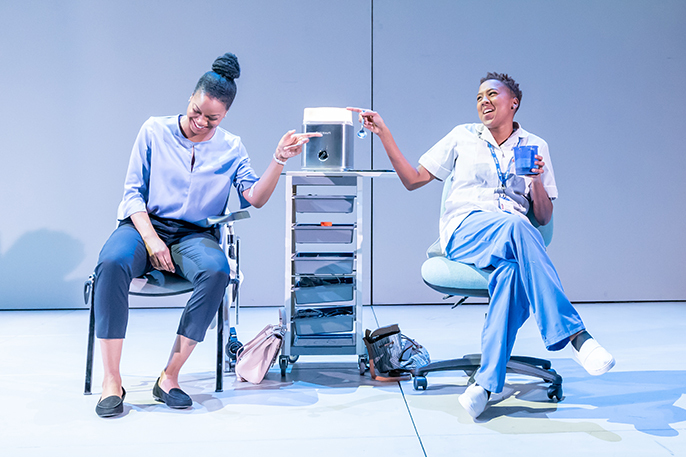 The Phlebotomist does not disappoint in this regard; Ella Road’s Susan Smith Blackburn and Olivier Award-nominated script is a particularly fine and beautifully-crafted example of this always thought-provoking style of play. Which is impressive for a first play. 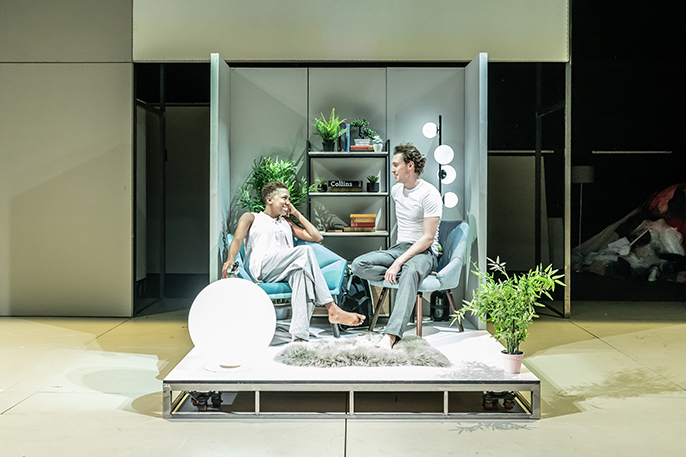 I’ve never been to the Hampstead Theatre but I’m sure it will become as favourite as I feel at home here; its modern clean architecture from an upgrade in 2003 also maintains some of its rich history from its inception in 1959. I’m excited to see what this play is about - the synopsis doesn’t give too much away at all. And as it begins, I quickly gather that this will be a theme that continues throughout - we never get the full details of each of the characters’ stories, only snippets. A backstory in the dialogue here, an allusion there. We know, we feel in our blood, that there are secrets, there is subterfuge. We are told that “As long as there’s a game, people will find a way to cheat it”. Largely though, this is a story about the human condition centered around a few characters - Bea the Phlebotomist herself, Aaron a man she meets and falls for early on, and Bea’s childhood friend Char. It’s an exploration of the values that drive us, set against a future that we’re not given too much detail about, aside from the idea that the whole country revolves around a blood rating system, scaled from 1 to 10. Those with ‘good’ blood do well in life, getting great jobs and being matched up with others with a high blood rating. Those with ‘bad’ blood... well. Prospects aren’t great. 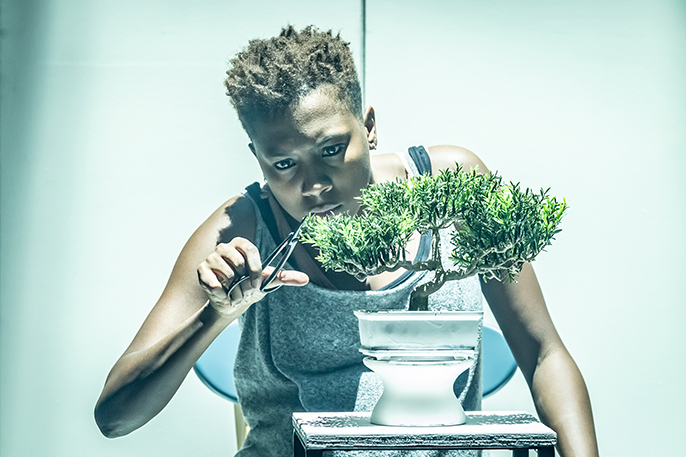 Our protagonist, Jade Anouka’s Bea, does the blood tests, and hence is a sort of gatekeeper to people finding out where they fall in the pecking order. 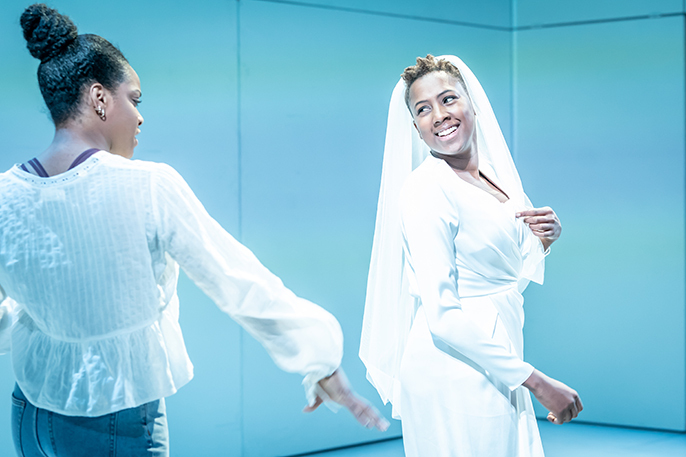 In the first half, Jade Anouka’s Bea is very expressive, perhaps overly so. But ultimately Anouka’s portrayal of this woman is endearing and authentic in a way that reminds me of my aunty Sharon. 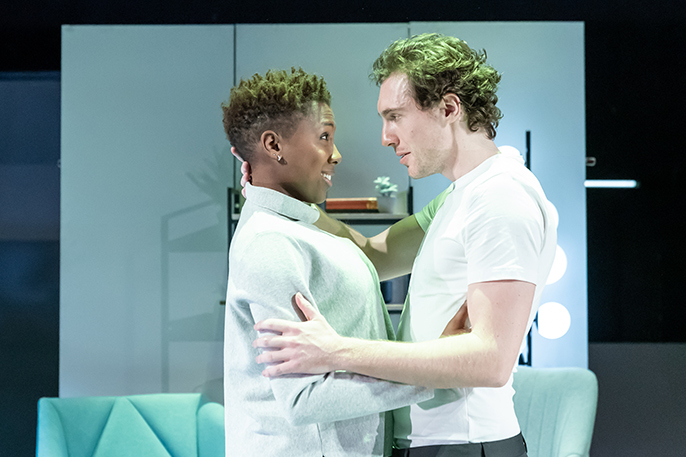 I believe and become quite invested in Bea’s romance with Aaron, played by Rory Fleck Byrne, one of the numerous Irish actors in this production. Their interactions as a couple are sweetly romantic. I want them to do well in their relationship, despite the feeling that Aaron is somehow going to let Bea down. Bea’s shortcomings are laid bare, Aaron’s more elusive, difficult to fathom. An intriguing coupledom. Kiza Dean steals the first half though, with her natural delivery of the some very real dialogue as Char, including the most realistic use of expletives I’ve ever come across. It’s like she’s not even acting, in a good way. As her character shifts and matures, she rides Char’s life undulations so that time speeds up without us noticing. We do notice though that the screens, which form a backdrop of ad-hoc news bulletins and ads between scenes, dilapidate and dismantle as we move through the story. Everything is grey, from the walls and floors down to the costumes of our characters, all evolving with time. Cold, expressionless. A minimalist’s dream. The costumes seem straight out of high-end retailer Cos, in a way that makes me rethink exactly how pretentious that boxy jumper I bought from there last month really is. It all makes for a scarily familiar tone - perhaps this future is not 50 years away, but maybe closer to one. The one, and only shortcoming of this play is the point where I get a little bored. It’s not the delivery of Mark Lambert’s portrayal of David, the porter, as his practiced and effortless timing does the part important justice. No, it is simply a scene that is too long; I almost stop hearing his words. I feel a discomfort that great art often evokes. All of that is forgiven in the second half...wow. 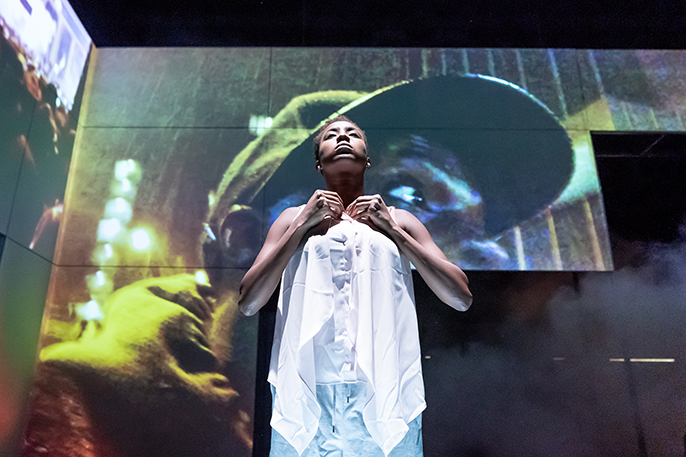 Jade Anouka is a versatile performer, with work spanning theatre, film and television, and I understand why she’s hot property - her performance moves me, speaks to me at the deepest of human levels. 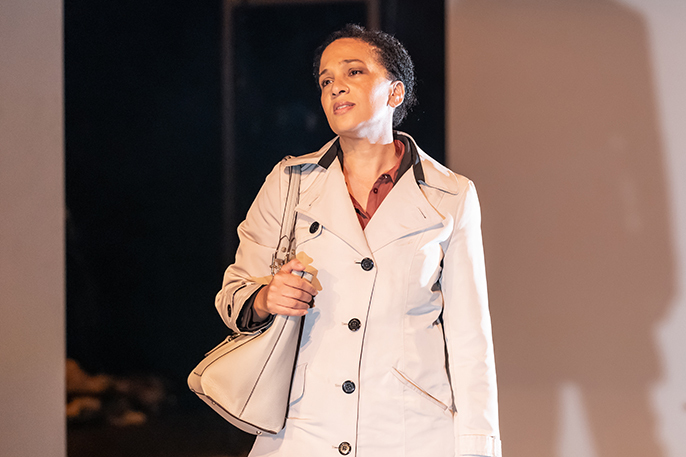 The kind of passion that puts you in someone’s shoes should never be underrated, and Anouka delivers Ella Road’s lines like she is living this as her truth. By the end I am in awe, shock, questioning my own choices and opinions. Feeling as grey and sparse as the intentionally-designed set. Would some of these scenarios actually happen? Would we descend into quite such chaos? I feel a discomfort that great art often evokes. Corruption, parallels with drug dealing, questions of innocence, that eternal swiping right of our generation’s social media culture. It’s all there, with impressive subtle and timely lighting and sound at key moments, making me feel unsettled in a way that will stay with me for a long time.